Christmas is coming, and with it Big Gaming Week. So its time to start putting together my Christmas games for playing with friends both old and new. Somewhat at random, while focused on studying roleplaying games, my brain clicked into place with a couple of problems I had been having with boardgame design. Namely, how to balance income and costs, with fleet strengths and map positions. First a quick recap on an approach to combining a decline theme with players gaining control of parts of the Imperial bureaucracy. For the last playtest I built a track on which Dreadnoughts could be purchased, with each purchase bumping the Dreadnoughts not chosen down the track (making them cheaper). This worked pretty well. 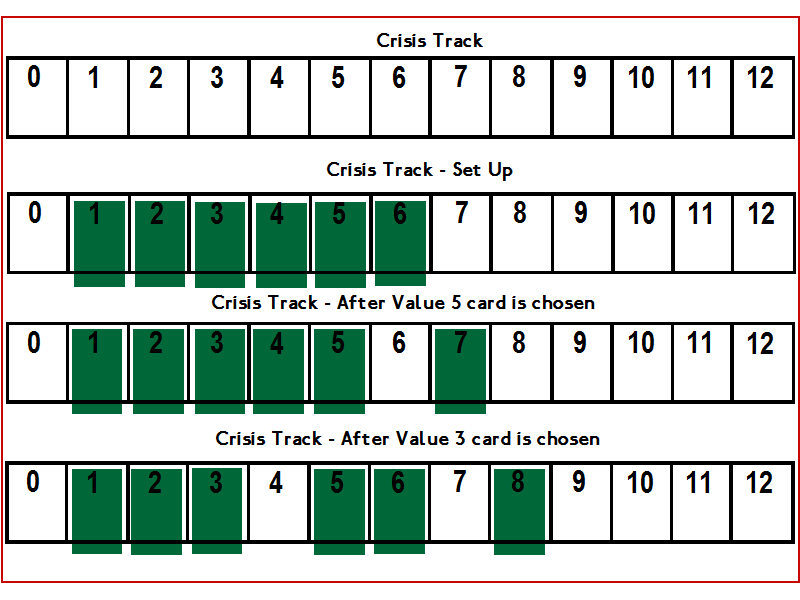 In the example above, the first choice is made to buy the Dreadnought in the value 8 slot, the value 7, 9, 10, 11 and 12 cards all slide down the track one space, and a new card spawns in slot 12. Then someone buys the 10 slot Dreadnought, and the process repeats. It puts the onus on the players of figuring out what different cards are worth. As long as a card is worth something, a player should pick it up. If a card did hit zero, that implies the players see it as worthless (and you should probably do something to make it more desirable). I also linked purchases to decline, by making the value of the purchases trigger events every time 13 points of corruption occurred. This worked, but it tended to trigger off every second purchase, so the granuality of the 1-12 track was not actually having much effect on play. As usually happens, I spent a fair bt of time thinking about how other games handle this problem. A Republic of Rome approach is just too complex. A Junta approach is too simple (and gives the portfolio allocater too much power IMO). So I scratched my head and tried to figure out a Goldilocks spot of interesting decisions but not too much paperwork. First evolutionary step from there, was realising that I did not need to restrict the track to Dreadnoughts. I could put pretty much any game resource on the track that I wanted to: Atomic Power, Monuments, Imperial Ninja, it could all go onto the Corruption Track. Second evolutionary step was decoupling events from the Corruption track, by instead creating a Crisis track. 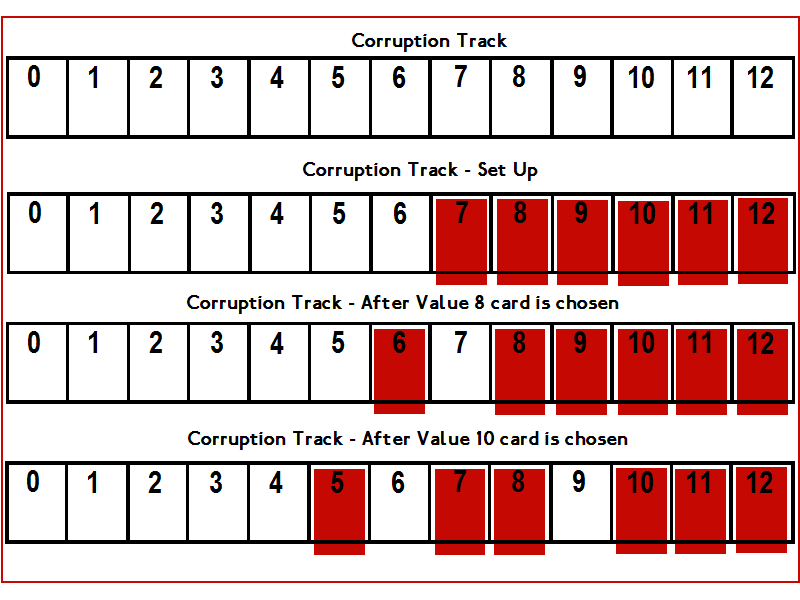 So the card shuffling and refresh is like the Corruption track, but its an increasing value over time. If a crisis goes off the top of the track, then bad things happen to the Galactic Empire. One of the considerations in the game is figuring out how players get the income they are spending on the corruption cards. In most of my playtests this income has come from control of territory on the game map. Which in multiplayer games always leads to players who fall behind in territory getting hit by the feedback loop (the poor stay poor, while the rich get richer). So, I am going to try making the main source of income, the player choice to exploit a crisis in a specific sector on the galactic map. Exploit a value 7 crisis, and get $7, exploit a value 5 crisis and get $5. The crisis is also how you deploy combat units on to the game map. So territory becomes more a consideration of positioning for the next civil war, and not a matter of life or death for the flow of income. Because there will always be six crises on the crisis track, no player can ever permanently run out of credits. Because you can always exploit a future crisis, no player can ever be permanently pushed off the game map. So now we get an interesting tension for player decision-making: do you spend your credit reserves on the tempting resources of the Corruption track, or do you go for more credits in the bank, plus some ships on the map. There should be a reason to want to succeed beyond just getting some credits and ships on the board. The reason to succeed is to gain the “Strong Admiral” buff that lets you try and usurp the throne (gaining Victory Points). Success/failure is determined by a dice roll. Its definitely more elegant if I can get the PVE and PVP cmbat systems in alignment. While I was thinking about this and different ways I could have dice rolled I had a bit of a brainwave. Logistics like fuel, ammunition and troop movement are a major constraint on real world operations. You can’t keep marching forward forever, soldiers need to sleep and machines break down. Keeping track of logistics in games, however, is deathly dull. I am not sure I can make bean counting decisions interesting for players, and counting stuff is time consuming. One of the things you see in history, is that people often kept their armies in the field at a smaller level of troops than what their maximum potential field force was. This saved you money, and reduced the chance of your army starving mid-campaign. A definite problem in space games, is that absent the terrain choke points of planets, the naval engagements reward concentration of force. This is what I think of as the “Supreme Annihilation Fleet problem”. The only viable operational deployment, is to concentrate your fleet in one space, and move it around destroying all weaker formations. This can lead to a strategic sitzkrieg of combat avoidance. Find all the matched dice. Eliminate all but one of the matched dice. Add the remaining dice together. The side with the highest score wins (attacker wins ties). Those matched dice not included in the scoring, are the ships you lose in battle. Side A rolls 4, 4, and 2. Side B rolls 4, 4, and 1. Side A eliminates one 4 die, and scores 4+2 = 6. Side B eliminates one 4 die and scores 4+1 = 5. Side A wins, Side B retreats. Both sides lose one ship each. With six ships, your maximum score in battle would be 21. Dreadnoughts with their big d12 extend the range of possible combat scores massively to 78. So bringing a bigger force to battle, definitely increases your chances of winning that battle. But beyond a certain force strength, there are diminishing returns and increasing risk of casualties. I will need to math out the probabilities and look to see if there are any weird breakpoints or outliers. I would let other game resources, such as Technology cards, adjust the die rolls, scoring and casualties. As a small raider force could be quite potent, a rule allowing a defender to retreat instead of giving battle may be needed for balance.